Talkingink custom t-shirts is a 20 year old screen printing business located in Saint Louis, Missouri. In that time we have printed countless up and coming t-shirts brands from high school aged kids to professionals with an idea and monetary means. In all, there was one thing that separated the successful brands from those that didn’t make it. Most people come to us with just the idea. They want to build their brand but they lack the capital or the plan to orchestrate the venture. It’s always going to be tough trying to launch anything without capital. However when it comes to launching a custom t-shirt brand there are a few ways around that capital and we have seen it happen time and again successfully. It doesn’t matter that you think your brand is awesome. Everyone else has to think it’s just as awesome or they’ll never buy it. Chances are better if you stick with a trending style in graphics or layout. While you might really like something that looks straight out of the 1970’s, if it’s not trending, chances are it won’t sell. Study your market and design your brand around what’s trending for the best approach. Even the most historic brands have come in and out of popularity, but when they their brand was born the style was trending. Know your target market and have a precise idea who will buy your shirts. While I feel redundant in saying this you wouldn’t believe that this thought doesn’t cross people’s minds. So have a price for your brand that fits in your target markets budget. You don’t want to retail a $50 t-shirt and have high school age kids as your target. While there are brands who can successfully do this, they are few and far between and a start up doesn’t have the big corporate dollars to infiltrate the market with advertising. When first starting out try to keep things simple. Research your market and cater to that particular market. You will have more success zeroing in on a smaller precise niche market than you will with an blanket market. Buy low and sell high. Make sure you product is comenserate with your retail. If you want to command a high retail price for your shirt, the basic cotton shirt is not the way to go. It’s not in trend and design alone is rarely a selling point these days. People are paying just as much attention to the cut and feel of the shirt as they are the image printed on it. Most customers launching t-shirt brands are under the age of 25 years old. We have found that generally this age bracket has a good grasp on what’s trending and what might sell. The flip side is generally 25 year olds and younger have very little start up money. So it’s very important to know your market. How to launch a successful t-shirt brand can certainly be done with little money if executed the right way. How to launch a successful t-shirt brand depends on where you put what little money you have when you start. Time and time again we get people who come in and want to order one hundred t-shirts because they have five people interested in buying a shirt. Guess what? if you only manage to sell shirts to those five people you are stuck with a lot of costly inventory. It’s great to be optimistic but you have to be smart with your start up money and spending it on inventory is not the way to go. The only time purchasing inventory makes sense is if it’s your design is event oriented. Meaning you will sell them at a specific location for a specific amount of time such as a concert or trade show or flea market. Other than one of these types of places there is no reason to purchase inventory. Don’t assume everyone on earth is a potential buyer. Find your market and stick with that. When starting out a smaller precise market is far more beneficial than a larger loose market. We here at Talkingink have used our 20 years of experience in screen printing logo wear that we have helped otherwise non successful brands become successful. You as the brand creator have to do your homework and know your market. Everything else we can help you with. First, rather than order costly inventory, we suggest taking advantage of our free online stores. This way you have a place where people can see your brand. They can check out what you have to offer and you haven’t spent a dime to do this. They can browse your online store and if interested, buy a shirt. Second, utilize social media to build your brand awareness. This could be done with a dedicated product facebook page or twitter account. Blast social media and if the budget allows, run some ads. You haven’t purchased any inventory so what little money you have should be geared towards building brand awareness. Third, You have the brand awareness and people start buying from your online store. Talkingink will start proccessing and shipping orders and only now that we are printing shirts do you spend money on the shirts. But it’s not your money, it’s your customers money that you are using to have us print your brand. Once a person purchases your shirt from your online store, that money is then used towards the cost of the actual shirt they are buying leaving you with the profit. You never have to spend your own money printing shirts. 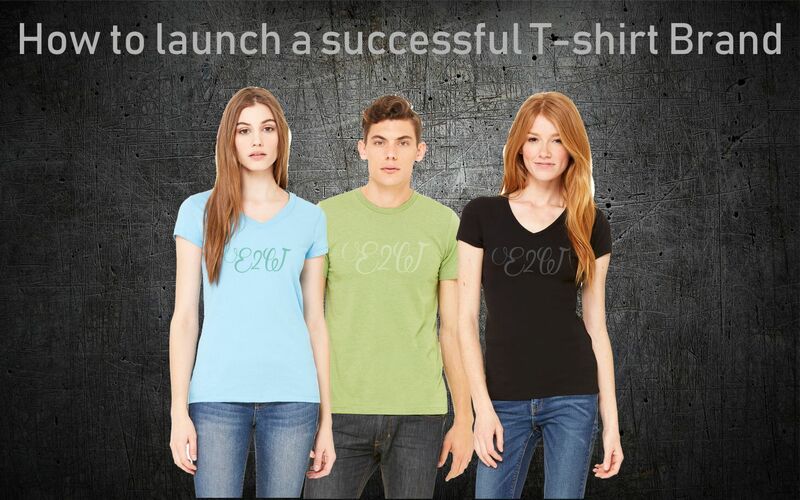 Talkingink will work with you and show you how to launch a successful t-shirt brand. We will do so in such as way that your up front cost are nothing, and there is no ceiling to your success. You’ll have to bring your idea and market to the table and from there we can help you get started. To learn more simply contact us and we’ll be happy to discuss further.